Love fried ice cream but the “fried” part doesn’t quite fit into your diet goals? Try this special Mexican dessert for a new twist on an old favorite: Mexican Fried Ice Cream. This ice cream tastes exactly the same as fried ice cream, but it’s not fried! This will definitely be my new go-to dessert for Mexican night in our house! Step 1. Place corn flakes in a ziplock bag and use a rolling pin to crush them until flakes are very fine particles. Step 2. Place crushed flakes onto a large plate. Step 3. Run your hands under cold water to make sure they are cold enough to handle ice cream. Scoop out 1/2 cup of ice cream at a time and mold each 1/2 cup of ice cream into a ball. Quickly roll ice cream ball into the corn flakes until ball is completely covered. Place immediately on a plate in freezer. Step 4. Repeat for remaining three balls of ice cream. Step 5. Freeze ice cream balls until just before serving. Step 6. When ready to serve, place ice cream balls on individual serving plates and drizzle chocolate sauce and honey on top. Serve immediately. 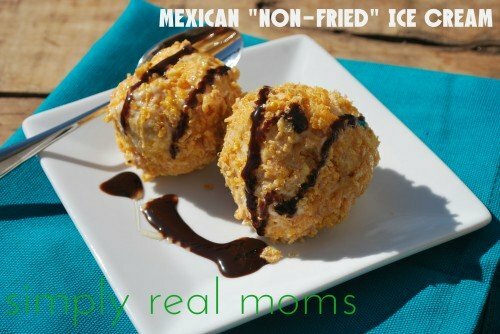 Try this healthier version of "fried ice cream" on your next Mexican night! Place corn flakes in a ziplock bag and use a rolling pin to crush them until flakes are very fine particles. Place crushed flakes onto a large plate. Run your hands under cold water to make sure your hands are cold enough to handle ice cream. Scoop out ½ cup of ice cream at a time and mold each ½ cup of ice cream into a ball. Quickly roll ice cream ball into the corn flakes until ball is completely covered. Place immediately on a plate in freezer. Repeat Step 3 for the remaining 3 balls of ice cream. Freeze ice cream balls until just before serving. When ready to serve, place ice cream balls on individual serving plates and drizzle chocolate sauce and honey on top. Serve immediately. Oh my, YUM! I am going to HAVE to try this out! It is sooo yummy and easy to make! Hope you enjoy it!